These bite-sized Shortbread Tarts are irresistible. They are made with a buttery shortbread that is wonderfully tender crisp. After baking, each tart shell is filled with a creamy No Bake Cheesecake Filling. Delicious on their own, but I think they are especially tasty when studded with fresh berries (blueberries, raspberries, blackberries, and/or strawberries). To make the tart shells we start with a shortbread dough that contains a little cornstarch (you could also use rice flour), which makes the shortbread nice and tender. Once the dough is made, you press small rounds (about 1 tablespoon or 15 grams) into lightly buttered miniature muffin tins (if possible use a non stick pan). Then I like to put the shortbread-lined pan into the freezer while I preheat the oven, as this will firm up the shortbread and helps to prevent it from puffing up during baking. But if you find the shortbread still puffs up, just lightly prick the centers of each shortbread, with the tines of a fork, about halfway through baking. The shortbread tarts are filled with a no-bake cheesecake filling, made with cream cheese, sweetened condensed milk, freshly squeezed lemon juice and zest, and pure vanilla extract. A few notes on the ingredients. Use a full fat (regular) cream cheese. Don't use fat free cream cheese as it's too soft and will prevent the filling from becoming firm. Along with the cream cheese, the filling is made with sweetened condensed milk, which is actually a ready made concentrated sugar syrup. It is made from a mixture of whole milk and sugar that has had about 60 percent of its water removed. Its consistency is thick and sticky (like honey) and it is very sweet tasting. When choosing lemons use organic if possible. Look for ones that are fragrant with brightly colored yellow skins. The best ones are firm, plump, and heavy for their size. Don't buy lemons that have blemishes, soft spots, or are hard and wrinkled. Lemons consist of a yellow outer rind (skin) that can be of varying thickness and graininess, and can have either a bumpy or a smooth texture. This outer skin is where most of the lemon's wonderful tangy flavor is located. Before removing the outer rind (zest) make sure you wash the lemon thoroughly (soap and water is best). When removing the zest do not remove the white membrane (pith) that is underneath as it is very bitter tasting. Now, when you first make this filling it is quite soft so it needs to be refrigerated until firm, at least eight hours, but preferably overnight. This also gives the flavors time to soften and mingle. In fact, the filling can be made and stored in the refrigerator for about a week. No Bake Cheesecake Filling: In your food processor or electric mixer, beat the cream cheese until creamy and smooth. Add the condensed milk, lemon juice, lemon zest, and vanilla and process just until smooth. Transfer the filling to a bowl, cover, and refrigerate for at least eight hours, or preferably overnight. Can be covered and stored in the refrigerator for about a week. Shortbread Tarts: Lightly butter, or spray with a nonstick vegetable spray, 48 miniature muffin tins (approximately 2 inches (5 cm) in diameter). In the bowl of your electric stand mixer, fitted with the paddle attachment (or with a hand mixer), beat the butter until smooth. Add the sugar and beat, on medium speed, until smooth. Beat in the vanilla extract. Scrape down the sides and bottom of your bowl as needed. Add the flour, cornstarch, and salt and mix just until incorporated. If the shortbread dough is too soft to roll into balls, cover and refrigerate for about 30-60 minutes. Meanwhile, preheat your oven to 325 degrees F (165 degrees C) and place the oven rack in the center of the oven. 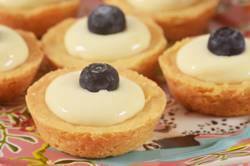 To serve: Using two small spoons, fill the tart shells with the cream filling. (Can also place the filling in a piping bag, fitted with a small plain tip.) The filled tart shells can be made several hours in advance and refrigerated. Just before serving top with fresh berries or cut up fruit. Makes about 48 - 2 inch (5 cm) shortbread tarts. Any combination of berries (blueberries, strawberries, blackberries, raspberries) or other fruit such as slices of kiwi.